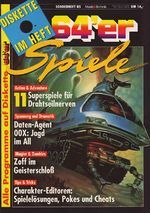 Cover of the first issue of the German "64'er Magazine" in April 1984"
64'er (ISSN 0176-8824) is the title of a German magazine, monthly published from 1984 for the Commodore 64. The publisher was Markt & Technik. In the first time as the C64 was selling at the outlet, there was a deficiency of information for this new computer system in Germany. Few C64-reference-books have been published at that time, but for many people the level of information was too sophisticated. A large number of books in English were available, but the language barrier was a problem. One computer magazine, called "Computer Persönlich" (abbr. CP), also published by "Markt & Technik" closed an important gap with a moderate information-level about computer-knowledge for everyone. The C64 had its place in the rubrics: news, tout and hints and program listings. The popularity of the C64 was rising and more magazine-reader participation with questions, knowledges and own programs. 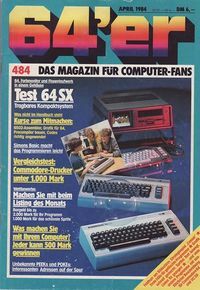 In 1984 the publisher "Markt & Technik" made the decision to publish a new computer magazine called "64'er" (subheading: the magazine for computer-fans). The first issue (04/84 in the year 1984) was published at the German computer-tradeshow CeBIT. The chief editor was Michael M. Pauly, who was the chief editor for the publications "Computer Persönlich" and "Happy Computer" (first issue 11/1983 under "Hobby Computer" in the year 1983) as well. The vice chief editor was Michael Scharfenberger and the other journalists, who have donated their work for the magazine "Computer Persönlich", were Albert Albsmeier and Georg Klinge. The computer magazine "64'er" had the same rubric-mix as "Computer Persönlich", but only for Commodore-computersystems (C16, VC 20, C116, C128 or Plus/4; shortly AMIGA or Archimedes) focusing on the C64. The rubrics were News, Hard- and Software (including games) product tests , private small advertisements market, forum for readers, Workshops, Learning Lessons, Information for practice, Tout and Hints and a lot of Listings of computer programs. These listings have often been determined by reader-competitions like "Listing of the Month", "Application of the Month", The beautiful Sprite", "The funniest program", "2Kbyter", "5Kbyter", "20 Liners" or "one-liners". The rubric-mix between information and amusement was well balanced and so was the reading a relaxation. The magazine measurement was at the heyday over 200 sides. While other homecomputer systems were visualized in "64'er" and had got a little space in form of a standard rubric, other computer magzines from publisher "Markt & Technik" grow up like "AMIGA-Magazin" (1987 first special edition at CeBIT 1987, first issue: 6+7/1987), "PCgo!" (first issue: 10/1993) or the special editions "Archimedes Computer-Faszination" (1993). The imprint since issue 11/91 was "Die Nummer 1 für C64 und C128" (The number one for C64 and C128). To help readers by typewriting the program listings, at the begin of the year 1985 the little programming helpers MSE (Maschinenspracheeingabeeditor / Computer Code Editor / for Assembler-Listings) and Checksummer (Prüfsummenprogramm / to check the right BASIC-Codes) were published. In the next months the programming helpers were upgraded. 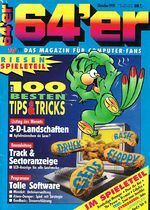 Other German computer magazines published this helper-methods, too. Over the years the program listings were filling more and more pages and became too big. At this time the readers could order the programs on datassette- or 5,25"-disk. This was called the program service (German: Programmservice). With the issue 06/94 the disk was included in the magazine. The issue 05/94 was the last issue, which was sold in shops. The magazine was only available by mail order. After a fusion with the German diskmag "Magic Disk Classic 64" from publisher Computec Verlag the imprint dissapeared with the issue 2/96 and the title was changed into "64'er - Magic Disk 64 Classic". The software from these diskmags were republished at the magazinedisk. The last issue, which had a editorial editing, was 11/96. The following issues until issue 01/99 were only published on a disk with an simple undesigned "64'er"-cover of 4 pages with short information. For this time the subscriber had got another computer magazine called "Power Play" (PC-Gaming-Magazine) or "PCgo!" (PC-Magazine), too. The issue 01/99 was the last issue of this fantastic and popular C64-magazine. The popularity of the "64'er" was huge. Special editions were published on a regular basis. The main focus of these editions were themes like Tout and Hints, Adventures, Graphics, Printers, Diskdrives, Datassette, BASIC- or Assembler-programming . Some specials with the title "128'er" for the computer C128 were also published. The specials were printed on better paper and in the first years the content was over 200 sides. In the specials some programs were released, which have never been published in the monthly "64'er"-magazine, because the program code was too big. The first special edition called '1.Programmsonderheft Tips & Tricks' was published as No. 01/1985. In the year 1985 eight special editions were published. At the middle of the year 1986 the specials were issued monthly and the issues were numbered (special issue 08/1986 = 8 special issue). That was the specials issue 16. Over the years the program listings were filling more and more pages and were too big. At this time the specials (with special 37) a 5,25" disc was included. Firstly in the Gaming-Specials. At special issue 46 the disk was regularly included. The specials ended with issue 97 (focus: games) in the year 1993. Intermittent the editors were testing other specials like "64'er Disc" (two tries, one in 1990, another one in 1991) or "64'er Top Spiele" (only issue 1-6). In "64'er Top Spiele" games have been tested and solutions and hints were printed. Until issue 2 a 5,25"-disk was included with interesting games and level editors or tools. 1993 was a 12 pages special, called "64'er Extra", with popular programs on a 5,25"-disc. Another special (main focus: all C64-hardware), which is titled as "Einkaufsführer 1/93" (shopping guide), was published. In 1994 the special "Extra 1/94" focusing on GEOS, including a 5,25"-disc, was published. The label "64'er" was a very important brand for the publisher "Markt & Technik". The firm published some books for many themes and bookware (games, tools and applications) under this label as well. Bookware "64'er Power Pack" (No. 1-3); a collection of a "64'er Extra" and a great game of "Markt & Technik" software series "Power Game". At the beginning of the year 1995 a archive CD "64'er CD" was published with all discs of the 64'er magazine and special editions of the years 1984-1994. The fileformat was in D64 imagedatei and can be used in C64 emulators, which are supporting D64. But only a few discs are damaged and not on the CD. Cover of "64'er - Grosser Einsteiger-Kurs"
Cover of "64'er - Die Floppy 1541"
Cover of "64'er - 35 ausgesuchte Spiele für Ihren Commodore"
This page was last modified on 20 May 2018, at 01:37.